And now we see where the dolphin I posted about last week ended up. This is more of the blue mahoe wood. The dolphin carving was described here. 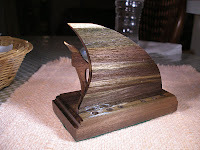 The base of this pen holder was cut from a block of 1x4" wood and a roman ogee router bit applied to the edges. I also drilled six 1/4" holes along the back edge for tip storage. The fin was several 1/4" thick "boards" (it's hard to call them boards when they're 3/4" x 1/4" x 4") edge joined to show off the grain. I smoothed them with a palm sander, then cut the shape of the fin out with a coping saw. A dremel with a drum sander smoothed the edges nicely. 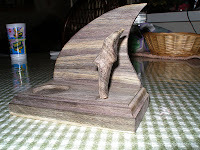 An oopsie happened with the mounting of the dolphin to the base. 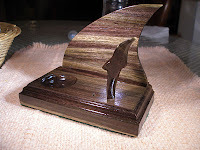 The 1/8" tab I carved into the base of the dolphin snapped off after gluing it to the base. It obviously wasn't strong enough for this use! I fixed it and made it stronger by sanding the piece that stuck in the base smooth, sanding the bottom of the dolphin smooth, and creating a steel brace. I hammered a thin nail into the base. Using a pair of wire cutters, I snipped off the head of the nail. I used the smallest drill bit I have (1/32"? I forget) to drill a hole in the dolphin for the pin to rest. Glue was put in the hole and thinly spread on the bottom of the dolphin. I put it in place and wrapped the whole thing with blue masking tape. MUCH stronger now! No stain whatsoever was applied. Just six coats of Minwax Poly out of a rattle can. Because of the high oil content of this wood, the poly took a week to dry. I did a test piece comparing shellac and this poly. 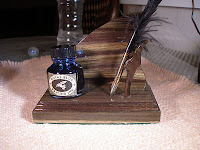 The shellac masked the grain and blackened end grain. The poly did neither. Because the grain in this wood can be so subtle, I didn't want to take any chances with covering it up. A green felt sheet was glued to the bottom to protect my desk. I considered red as I used for a blue mahoe coaster I made, but the red is too bright in comparison with the dark wood. I like this wood. I just wish it would maintain its blue color when finished. It's still attractive with a finish, but I don't know if it's worth the $10-12 bf it costs. But it sure makes neat stuff!